An excellent addition to concession stands, buffet lines, and other foodservice operations, this Carnival King WPLL35 3.5 qt. 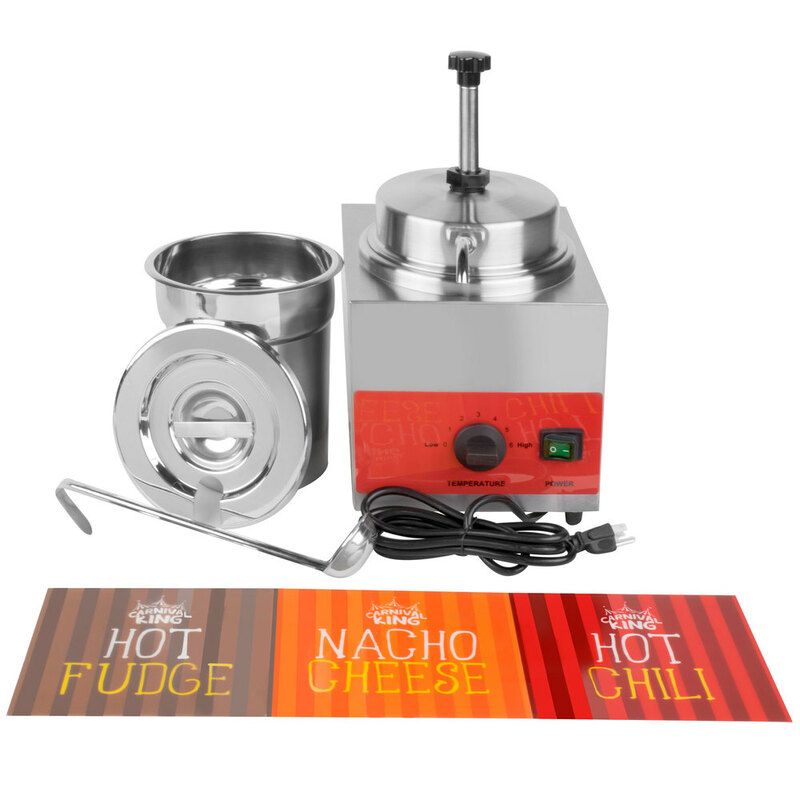 warmer provides you with a simple way to heat and serve nacho cheese, hot fudge, chili, buttery popcorn topping, and even soup and gravy! It accepts #10 cans or 3.5 qt. insets for invaluable versatility, allowing you to drop your canned items directly into the warmer, or, if your food comes bagged or in an otherwise different packaging, fill the included inset. For applications that utilize the pump and spout mechanism, use a #10 can to dispense product to closely monitor portions to help save on costs. The pump feature is not designed to be used directly with an inset, only with a #10 can. The ladle makes serving your delicious product a breeze while the notched lid keeps the contents piping hit and gives the ladle a convenient resting place. This warmer comes with 3 decals for simple product identification, including hot fudge, nacho cheese, and hot chili. The decals slide in and out so that you can easily use your own custom decal or, if your needs change, serve different toppings out of the same warmer. With just a manual temperature control and an on/off toggle switch, this machine couldn't be any easier to operate! The unit's stainless steel construction helps to ensure long-lasting performance and rests atop 4 rubber feet that keep it securely in place during use. A 120V electrical connection is required for operation.